I wonder why he wants us to have reasons to hate him, he's a part of L0 now, how could I h-wait, WHAT? You thought Dragon's Crown was hot garbage? Dragon's Crown was badass! S'wrong with you man?!?! Really though, I wish we got to read a bit more about his design philosophy. Longer blog posts in general would be a welcome sight, seeing as how we won't have anything new outside of cons and streams until release. Very interesting to read about the changes. It's funny, because using the axe once per jump was actually my initial impression of how it worked from the very first gameplay footage. 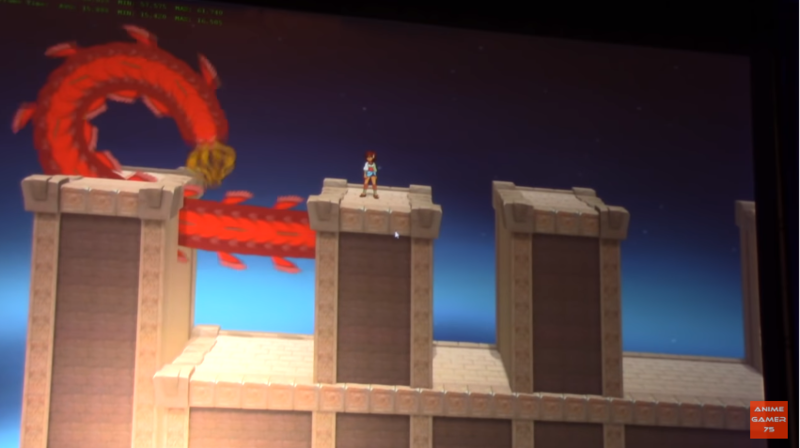 Once we got the Prototype though, being able to use it multiple times on a wall seemed to make logical sense, and offered some vertical movement I wasn't expecting. That said, in watching many other playthroughs, I've also noticed what Mathew describes in the update, about how people would often forget the walljumps once they started using the axe. This would make them actually take longer to climb some areas later while they were exploring. So if further playtesting revealed even more similar issues from it on top of level design challenges, then I trust the changes really are for the better. 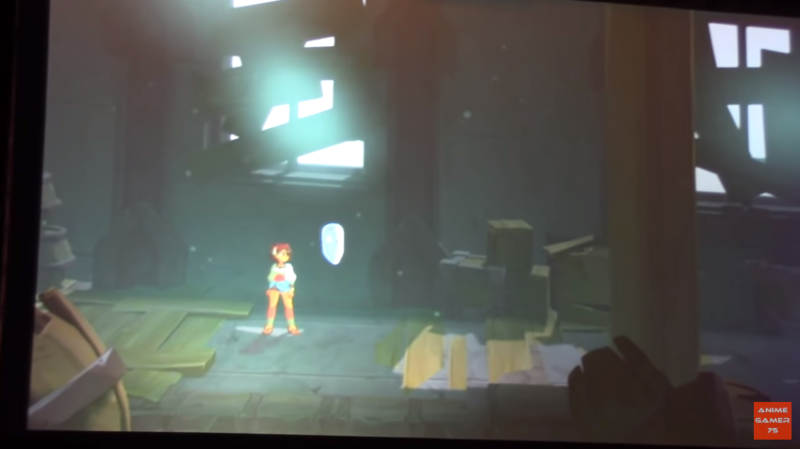 We didn't need the axe-hang to become Indivisible's equivalent to Metroid 2's Spider Ball. However, I do think the new change should probably come with some added visual feedback, if it doesn't already. I could see there being a kind of nagging arbitrariness to the axe if it only works once on a wall, but then players later see the spear working multiple times on a ceiling with no problem. 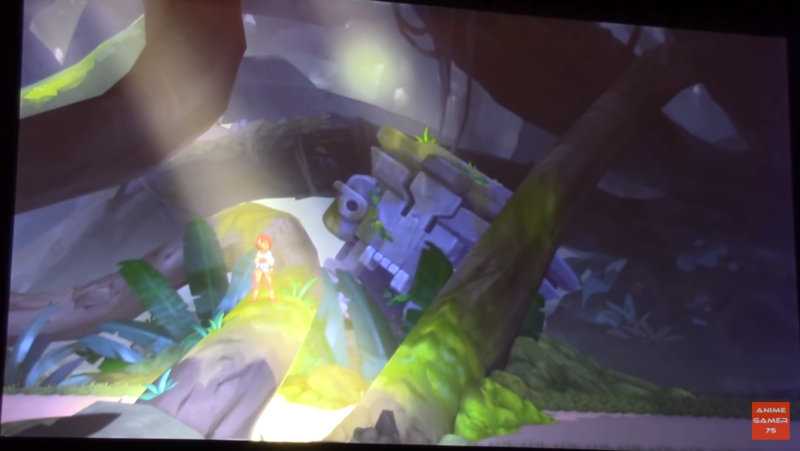 Maybe now when Ajna jumps from the axe-hang, we should see the axe still left in the wall after she jumps, showing that she just let go of it. She could even be locked out of using the axe for a second or two, until the axe disappears from the wall and naturally returns to her arsenal. There won't be any question then, why she can't keep climbing with the axe, and it'll avoid those awkward moments where players keep swinging at a wall multiple times thinking their controls are broken. I was kind of fond of being able to go everywhere with Metroid 2 spiderball - in AM2R. In Samus Returns (never played Return of Samus) they just put spiked walls everywhere so they're impassable, while AM2R let me pointlessly explore the ceilings of all the caverns. There was at least one missile expansion hidden up in the ceilings though, but I think it was possible to see it first without having to spiderball...? Also I wonder how the axe being refreshed with every walljump would work. Well, that's concerning. I like axe climbing. And I like having a slow, steady pace where I can "mosey along" and take my time. Oh, well. And it's been ages since I played They Bleed Pixels, but I seem to recall quitting because it got freakishly difficult and punishing about halfway through. Something about uncontrollably drifting for half a mile because I got hit by spikes? 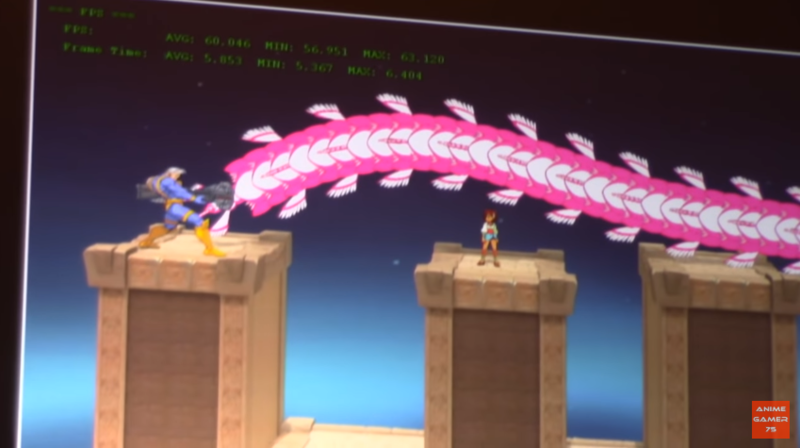 Hmm, as for visual feedback, and this is nothing but a large amount of extra art for nothing, but a "bounce" animation when Ajna hits the same wall again (Try smacking a wall with your weapon in Dark Souls or Kingdom Hearts and you'll know what i'm talking about) combined with a small push-back would probably send the clearest message of "Well, you just can't do this thing again". Doesn't have to be a reason, it's a video game and you just can't. That, obviously, would be a last resort in case there are playtesters that just aren't getting it, but I don't think L0 even has playtesters outside of themselves and Backer Preview players, So I think a special, especially "NO-ey" red hitspark when the axe slides uselessly across the surface of the wall with a gentle push-back effect will be the most cost-efficient way to get the message across. So I finally got around and watched the AX 2018 panel that KZN02 posted. 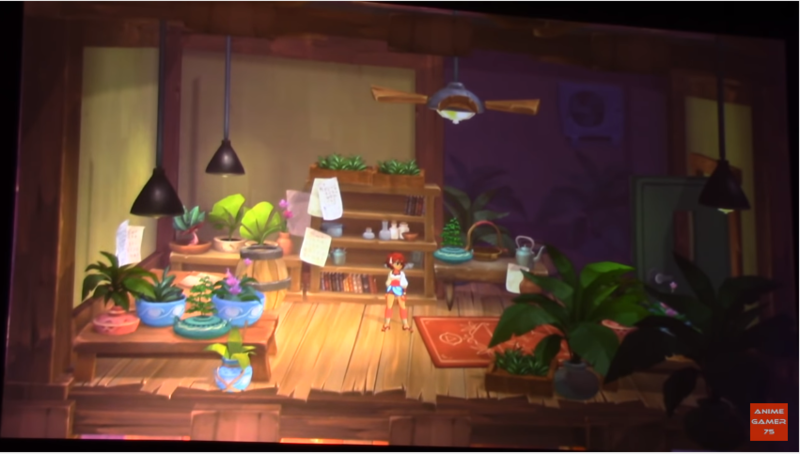 - Antoine: Mariel mentionned how he was pretty much a new character compared to his initial campaign design, though the team tried to still keep his core, his character as intact as possible. - Hunoch/Xiboch: He/they are a fusion of two characters from the initial campaign (presumably Tenoch and Tatanka for the ghost/stand thing?). Apparently Hunoch is the main one of the pair but both can switch between who's in ghost form and who's physically in the team (Or i misunderstood). The ghost one becomes a ball and can be shot at enemies, the ball comes back and by attacking again, it gets faster and does more damage. The ball gets different properties based on what brother is the ball at the time. They got a super where they grab their belt/goal and throw it and then spike the ball through it, hitting enemies. The stronger version of the super has them grabbing an enemy instead and do the same, cool stuff. - Leilani: Shown all colored. Mike describes her as a "like them until they fall over" character. - Sangmu: Shown all colored. In the top 3 of if not Mike's fave Incarnation. She wasn't shown much sadly. 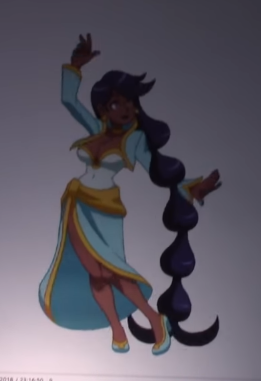 - Thorani: Not much commentary on her they just showed some out of context animations and water effects and such for her. 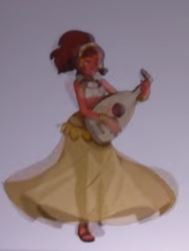 - Zahra: As described before I believe, she's a character that doesn't hit enemies at all and instead only casts buffs and debuffs. Enemies wise they didn't show much but a red sandworm of sorts. Quite creepy looking, it can turn itself into a drill or dash through the air. 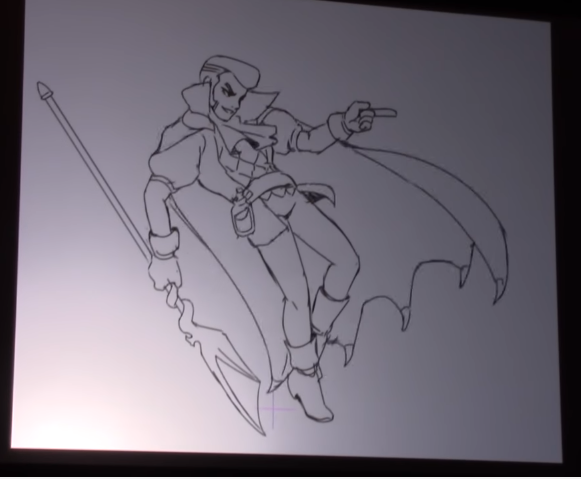 No concept art of villains like last year. 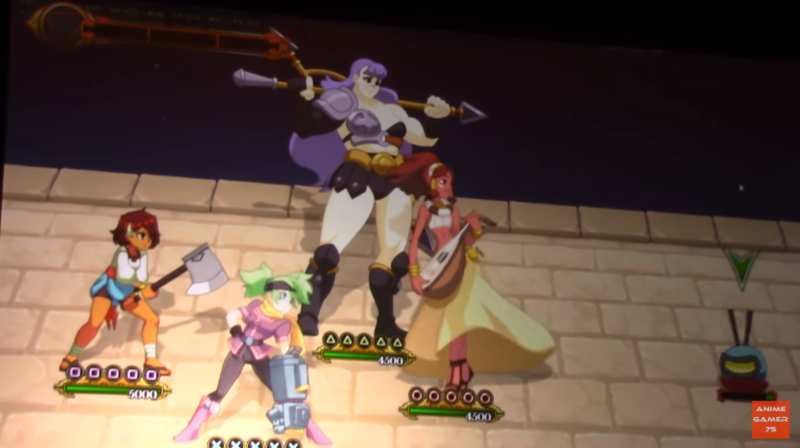 An in-game look at Phoebe, Zahra and Kampan! With updated UI that now shows which character is assigned to which button, which is better to me. And Hiroki Kikuta talked quite a lot actually, Earl was here to translate his words since he talked in japanese. Here's what he said, if some people are interested.
" 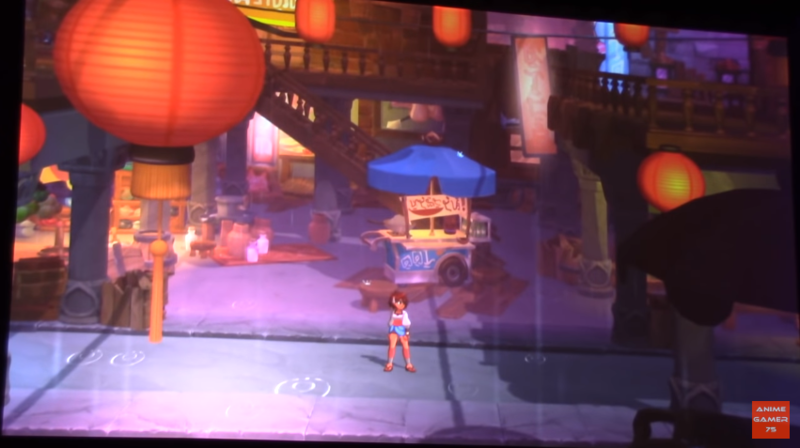 Indivisible is a very difficult type of game to create music for, because it's such a confluence of different cultures, and isn't from typical Western cultures that you might be used to but Japan, Asia, kind of the Southeast Asia area. Putting all those together and having a mesh is a little difficult to achieve. Because the task was to have all those mesh together and still evoke a very dramatic story, it's still a difficult process because you still want to be able to give it its own characteristics, but having this dramatic story being told through the music is difficult but. Part of the task is to create music that is in line with what the team's image of what the story is and make sure that the music nails exactly what the story is supposed to evoke... And it's very difficult to do that, because the team has such a particular image of what it's supposed to be, so whenever I send them a song and they're like « YEAH THAT'S EXACTLY WHAT WE WANT », that's one of my greatest joys when creating music. So one particular characteristic about game music is that you need to create something that people will ?? (i couldn't understand what was said here) because in games you need to be able to create music that people will listen to over and over and over again and not get tired of it. The trick is making something that evokes the drama, the action and the emotion of the game though music but make it in such a way that you can listen to it forever without really having those feelings. (because of this) "I'm very confident that you'll be able to listen to it without tiring of it so please play the game for a long long time ! " Also the first secs of the opening was shown and the guys from Trigger and Titmouse were very enthusiastic about it! It really was animated by Yoshinari and a small team which is honestly really impressive. 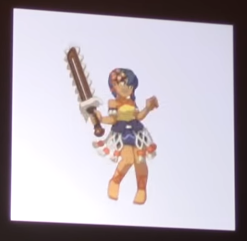 Apparently we might have got a Skullgirls anime of sort if things went differently and that's partly because of this that the Indivisible OP could happen. The Dave, KaboomKid, KZN02 and 1 other person like this. I understand the rationale for this change, but now this means the original pit climb is dead and that just feels wrong. Well there is a strong suggestion that infinite climb will be a late-game upgrade, so not necessarily. The Dave, Cheesedragon and ArgonBern like this. If your axe-hang is replenished after a walljump then the original pit climb is still possible. If you have to fully land on the ground then it wouldn't work. Not much is left to reveal that won't be a spoiler I guess. Shan and Cheesedragon like this. I'm just waiting for them to tell us Nuna is a boy. Tank... no offense but I think yours is turning into an obsession. 3 years of waiting heck yeah I'm obsessed. Has he mentioned it more than once? Well, twice now, but you know. The official YT channel posted the panel. KaboomKid and KZN02 like this. Full cast par the backer characters, hope we're able to see them sooner then later but they may end up being viewable only in game release. Shockdingo, Shan and missingno like this. They're perfect. They're beautiful. They look like Linda Evangelista. They're all models. Everything about them is perfect. Cheesedragon and Salty Umbrella like this. Now I don't mean to be a louse but I'm pretty sure Shan misheard in the above post. 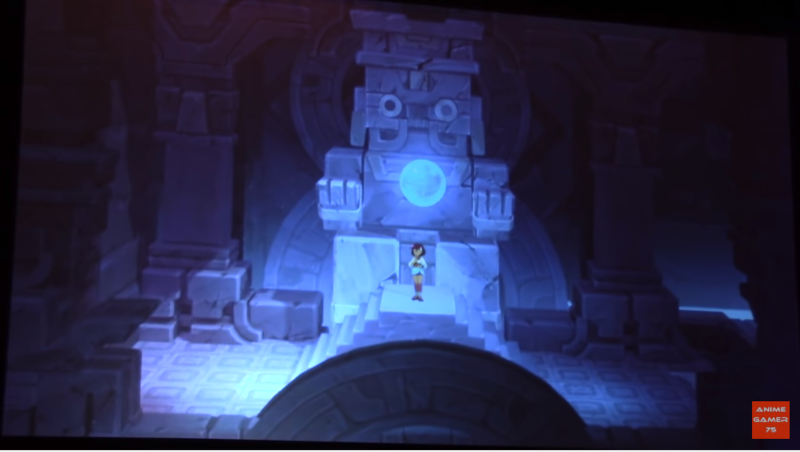 Earlier in the panel Mike is describing Xiboch's ball mechanics and says that "We tried to make every character completely unique. Some (Incarnations) will take a little time to get used to, not many characters will simply "be hit the other person until they fall over."" And then, when Leilani is shown he says she is one of the "(whack?) 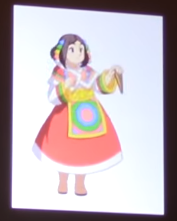 them until they fall over" characters, more or less implying she is one of the more straightforward characters in the cast, just using the base mechanics with nothing too technically demanding. It's very obscured by all of the background noise so no fault here, I just wanted to try and connect and clarify those statements to the best of my knowledge. Sad to see no Toko. Maybe we will see her in the distant future as DLC if the game does well. KaboomKid and Shan like this. So it looks like the main website has updated with a new layout and some new bio pages for the characters from the Backer Preview. Lots of typos and filler text though, and the community links don't appear to be working. I never plan to go to Gamescom. Maybe next year I should. Speaking of cons, I know it's really early to ask but I don't supposed Lab Zero is going to be at Lucca Comics & Games this year, are they? Not a lot of new stuff if you have been following previous interviews and such but we get to see a slighty updated preview build, with the button prompts from the AX panel from this year. 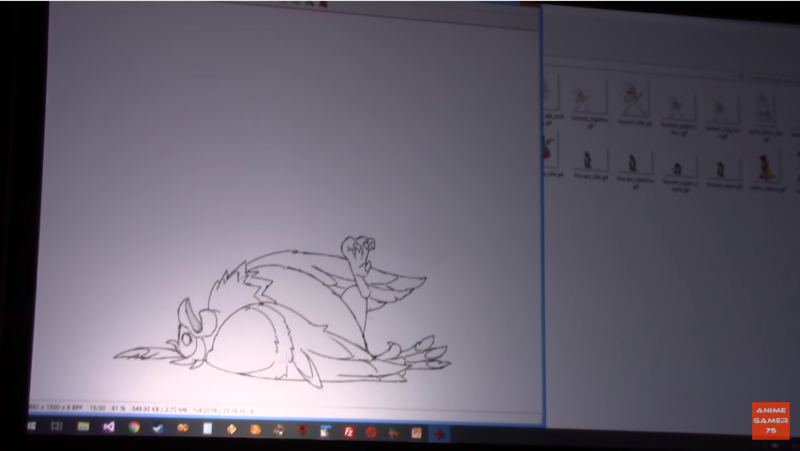 And some new animations too! 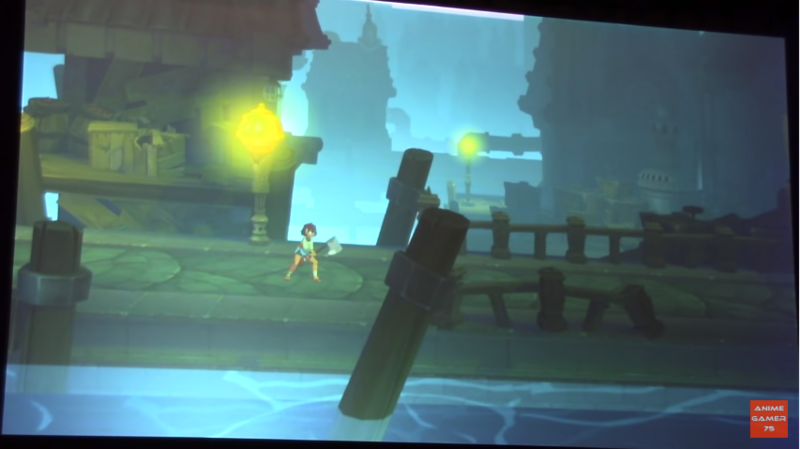 The "wounded" animations are new I believe (only Ajna had one i think?) though most are still wips and Ajna got a roll when she gets hit. Lot of new sounds. Also that poor guy didn't even know directional attacks existed LOL. Yeah Peter was definitely pretty hands-off with the guy, but I guess as a dev you're always curious to see how people respond to the game on their own. From the playthroughs I've watched though, it's surprisingly common for people to forget about the directional attacks after the first tutorial prompt, which I've never quite understood. At least the guy was using his Supers. Pretty much this. He wanted to see a sample of what may happen in the thousands when the game gets in everybody's hands next year. I'm thinking at this point they are considering adding a short but firm "reminder" tutorial if the game notices you've performed X or fewer up/down attacks or Iddhi Attacks X (3 or so sounds right) hours into the game. Even hardened RPG fans haven't handled a battle system quite like this before so something like that would be fantastic, in my opinion. Wonder what we'll see... Funimation uh? Don't you unlock directional attacks in the final game? That should help stop people from getting overloaded/confused and forgetting that they have them.